Imbued with rich detail of family life in a rural community, as well as a system of values at a time of transition in American history, this is the life story of France Davis, the dynamic pastor of the Calvary Baptist Church in Salt Lake City. It is an engaging story of courage and vision that describes coming of age in the segregation-era South, of dreaming, enduring with honor, and living at the forefront of major issues within the United States. 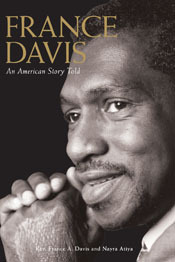 Recorded and skillfully written by Nayra Atiya, France Davis: An American Story Told, is an oral history, ethnography, memoir, perhaps even a life-enhancing sermon delivered with the strong voice of a preacher. The gathered strands of a life lived with conviction and grace will appeal to a broad spectrum of readers from the curious to those seeking inspiration. Winner of the Utah Book Award in Nonfiction. Rev. France A. Davis is pastor of the Calvary Baptist Church in Salt Lake City. Nayra Atiya was born in Egypt, raised in the United States, and now lives in Salt Lake City. She is an oral historian, writer, and translator. This is her sixth book.